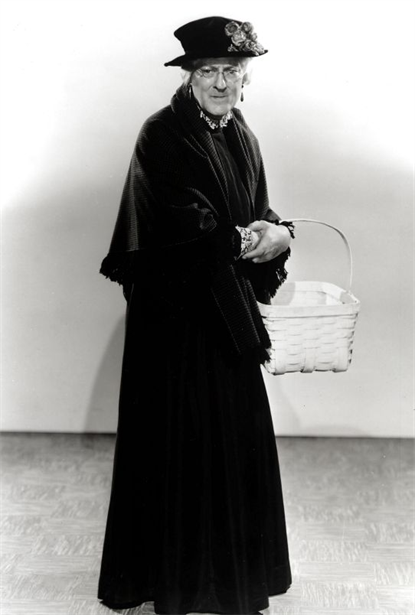 Who is this elderly lady with the basket, and what film is she in? The film is directed by a famous director. The old dear is part of a famous acting family, whose is held almost as Hollywood royalty. She had a sister called Ethel and a brother called John. The film is a classy affair with great special effects (by 1930’s standards). One of my favourite horror films, full of revenge but also full of heart too. Thanks,Stephen and Bob. I found this rare photo and now look forward to seeing Lionel Barrymore in his 1936 film,THE DEVIL-DOLL, directed by Tod Browning and costarring Maureen O’Sullivan and Rafaela Ottiano. Barrymore is in disguise,part of a ruse to exact revenge. Yes, that old doll is…diabolical in a way. Just beaten to the reveal there! So not a relative of Old Mother Riley. Was just about to give the game away! But think we all might know by now who she (he) is! Devil Doll isn’t a bad film, kind of a hoot, and that “lady” does a good job in the part! About to watch it,plus MAD LOVE. Just watched Devil Doll and enjoyed it. Barrymore played the old woman so well. Loved how he leaves his earnings on after taking off the wig – in case he had to change quickly. Didn’t understand why he couldn’t go back to his old life. The police would never associate him with the old woman. Nice to see Rafaela Ottiano in a substantial role.